What would you think if you found this on your windshield one morning?! I would smile and say "Thanks Will"
I would feel very happy. One time I found a note on my windshield. It was from someone who saw the person that backed into my car and they wrote down the license plate of the mercedes that completely mangled my bumper and drove off. I called the police but it was a parking lot "private property" so they wouldn't do anything. Still, I felt good that someone bothered to get the plate and leave me the note. I love Found magazine and I love that note! 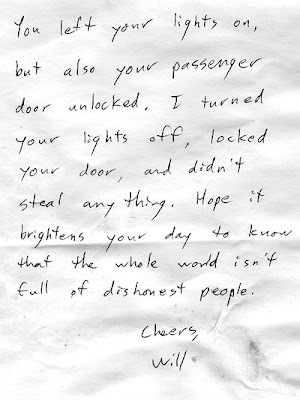 I'd be so happy to receive a thoughtful note like that from a stranger (and also relieved the my battery wasn't dead). What kindness! I would probably slightly freak out about the whole situation, but that made me smile and feel deep down gratitude! How wonderful! Wow, I'm so...paranoid? Disenchanted? I would rack my brain trying to remember anything I'd left in the car and make sure it was all there. Once my friend and I returned to her car in a parking lot around Christmas to find a bag of marshmallows with a little note that said "You've only been naughty, so here's the scoop: you're only getting snowman poop!" We'd locked the doors, and the cars next to us didn't have them, so we assumed they were poisoned or drugged or something and tossed them out. And talked about how creepy it was for about a year.